Looking at where else these words are used in the Bible, in Colossians it says that God makes peace or reconciles himself with us through Jesus. We were born separated from God but when we become believers he no longer sees our sinful nature but only sees our holy nature, due to Jesus’ blood given as atonement offering for us. If God can look past our ugliness and reconcile us to himself, when we do that for others we are acting as his children. Once you were alienated from God and were enemies in your minds because of your evil behavior. But now he has reconciled you by Christ’s physical body through death to present you holy in his sight, without blemish and free from accusation. For God was pleased to have all his fullness dwell in [Jesus], and through him to reconcile to himself all things, whether things on earth or things in heaven, by making peace through his blood, shed on the cross (Colossians 1:19-22). Salt is good, but if it loses its saltiness, how can you make it salty again? Have salt among yourselves, and be at peace with each other (Mark 9:50). At first glance you may be like, “Heh?” and so did I, but in reading the verses prior that speak of the terribleness of hell, and the statement, “Everyone will be salted with fire (Mark 9:49),” it became clear that Jesus is using the concepts of salt and fire as similar metaphors. Salt was used to preserve meat to keep it from decaying and corruption, turning it into beef jerky, whereas fire burns away corruption, such as purifying gold. Jesus is saying here that because we have the Holy Spirit in us as believers, we as part of God’s church act like salt in the world to arrest the decay of sin in others. As I’ve shared in a previous post, we don’t have the strength in our selves to not act in selfishness, and this sin of ego and self-love affects all our being, so the healing must come from God. When we lose the will to quarrel over offended pride and stop seeking after things in greed and jealousy, we are feeling the affects of the salt in us. And we then begin “salting” those who we might have quarreled with before and have opportunity to share with them what makes us different now. 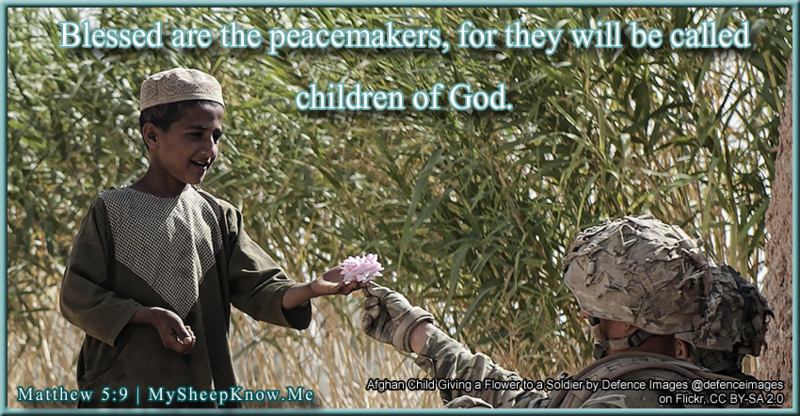 It is this change that declares to the world that we are children of God, his peacemakers. When we bring about peace with people, “salting” them with faith in God, he then can deal with their inner life first — their ego, will and heart — and then the outward conduct starts to change as well, just like salt working its way through meat. To people who say, “I will believe in God when I have proof,” I respond, “You’ll have the proof when you believe in God,” and it is this inner and outer change that will be their proof. There are several more verses that implore us to be at peace with others, but the last one that I want to share is Romans 12:9-21, which defines how we are to act towards others in the love of God. We can’t stop the evil in others’ hearts from destroying our relationships with them, but as much as we are able we are to try to live in peace with everyone we come into contact with. And if they act abhorrent to us, then we let go and let God deal with them, not seeking revenge and even blessing them while they curse us. And if we obey God in this, he will see us as his beloved children.